The Arch of Hadrian was erected in honour of the Roman emperor Hadrian sometime during the 131/132 A.D. An inscription on the western side of the arch states, ‘This is Athens, the ancient city of Theseus.’ An inscription on the eastern side of the arch states, ‘This is the city of Hadrian and not of Theseus’. Thus, the Arch of Hadrian was built in such a way that it acted as a partition or boundary between old Athens and new Athens. Also, visit the popular attractions in the city by following Athens itinerary 1 day. How popular is Arch Of Hadrian? People normally club together Syntagma Square and Theatre Of Dionysus while planning their visit to Arch Of Hadrian. People also prefer to start their day with Arch Of Hadrian. Well what can I say. This is the Hadrian's Arch, The Arch of Hadrian, most commonly known in Greek as Hadrian's Gate, is a monumental gateway resembling – in some respects – a Roman triumphal arch. 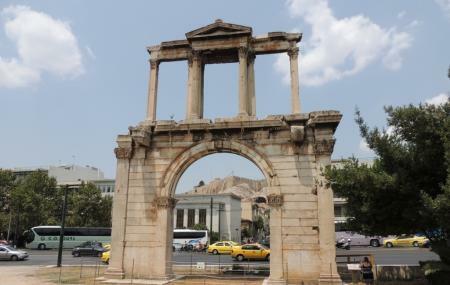 It spanned an ancient road from the center of Athens, Greece, to the complex of structures on the eastern side of the city that included the Temple of Olympian Zeus.I believe these old artifacts are deserve more attention and care. Easily accessible historical site, just few minutes walking from Syntagma metro station&square. Very well decorated and detailed. Impressive show of greek architecture. Also, as it is located along the way to the Akropolis, there is no entry fee, which is quite handy. Historically rich site in the center of the city. Better preservation is required thought.